Phosphopeptide Enrichment Lab-in-a-Plate is a patented coated plate technology for phosphoproteomics. 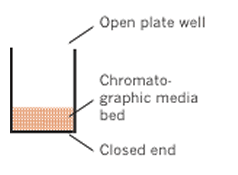 Lab-in-a-Plate coated plates work like ELISA plates, with MOAC chromatographic media embedded at the bottom of each well. Phosphopeptide Enrichment Lab-in-a-Plate contain proprietary MOAC media. Click the button below to add the Phosphopeptide Enrichment Lab-in-a-Plate to your wish list.